Johnny Manzielsaid Saturday night that he has found a roommate who is on a quest to get the troubled quarterback back into the NFL. "I'm living out here with my guy, Von Miller. 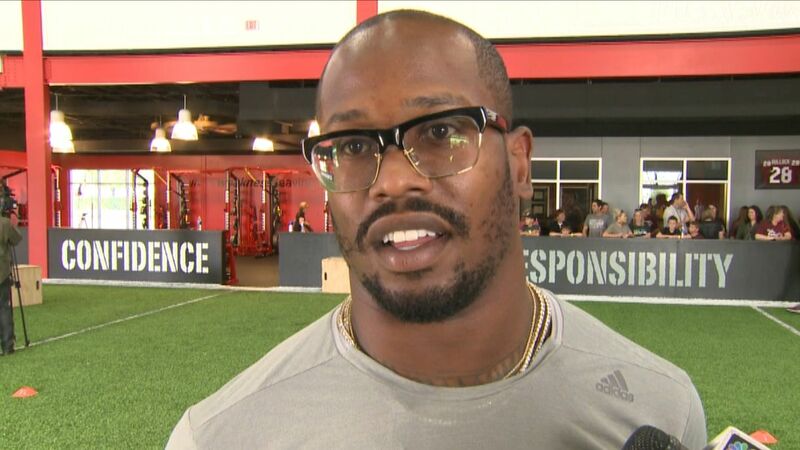 Everybody knows Von Miller. Super Bowl MVP, Von Miller, my brother. I'm living with him right now," Manziel told TMZ on Saturday night. "We're getting our lives together, bro." Manziel's comments were made in the West Hollywood area. Manziel briefly commandeered the TMZ camera before the videographer started asking him questions. Monday afternoon, however, Miller tweeted that Manziel isn't staying with him, but that he is his "brother" and he has his back. Sources tell ESPN that the quarterback is actually living with Cleveland Browns wide receiver Josh Gordon in an apartment off Sunset Boulevard. Gordon, who was suspended for the entire 2015 season after violating the NFL's substance-abuse policy and applied for reinstatement to the league earlier this year, reportedly failed a drug test last month. He has been awaiting word on his reinstatement request from NFL commissioner Roger Goodell. Manziel took to Instagram later Monday evening to clarify his living situation. "My bad V we were looking for some houses together didn't mean to get you caught up! Love you bruddah," he wrote. On Saturday, Miller advocated for the reigning Super Bowl champion Denver Broncos to sign his fellow Texas A&M alum. "If I had to make my decision on it, he would already be on the Broncos," Miller told reporters Friday. "But we've got guys in the front office that make those decisions, and they put us in championships with those decisions. "So I'm just going to follow those guys and have those guys take the lead." The quarterback-needy Broncos were linked to Manziel this past week, when two team sources told ESPN's Adam Schefter that Denver coach Gary Kubiak spoke with the former Heisman Trophy winner. Kubiak and Manziel, who both are former Texas A&M quarterbacks, spoke about Manziel being a potential fit for the Broncos down the line, the sources said. Before the Broncos would seriously consider adding Manziel, they want to see how his pending legal issues and potential NFL discipline are resolved, according to sources. Manziel called the Broncos a "great organization" Saturday, adding that "anywhere I get picked up, bro, is a blessing." "Whatever happens, I love ball," he said. "I want to play." Manziel, who said he has been out in West Hollywood five to six nights in a row, said he doesn't think NFL teams have a problem with his partying. "I don't think there's anything wrong with partying, bro," Manziel said. "There's a difference between partying and being out of control." Miller, the MVP of Super Bowl 50, has been vocal this offseason in his support of Manziel, who was released last month by the Browns. Miller backed Manziel in a recent interview with ESPN Radio's Mike & Mike, saying, "I don't think Johnny Football's days are over in the National Football League." The Broncos are in the market for a quarterback after the retirement of Peyton Manning and the free-agent departure of Brock Osweiler, who joined the Houston Texans. Mark Sanchez, acquired in a trade with the Philadelphia Eagles, and Trevor Siemian are the only quarterbacks on Denver's roster. The Broncos have also had trade discussions with the San Francisco 49ers regarding Colin Kaepernick but would need the quarterback to agree to a pay cut from his scheduled $11.9 million salary for 2016 -- a sticking point that has stalled talks. Denver is also expected to consider quarterbacks in the draft. Reigning Super Bowl MVP Von Miller says if it were up to him, Johnny Manziel would "already be with the Broncos."